The Kennecott Copper Mine was our first customer, back in 1937. The mine accounted for the majority of our $44,000 in revenues that year. We’ve continued to provide quality fabrication services for Kennecott over the last 82 years. Since our founding, we’ve gained many top mining corporations as customers. We’ve been able to successfully provide service to them as well as to our growing list of customers. As with our other services, Rex Industries’ team utilizes top CAD and CAM technology for the fabrication of mining components that are built to customer specifications. 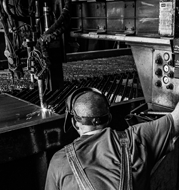 We are known for our intense attention to detail and are expert in working with galvanized steel, carbon steel, stainless steel, aluminum, and other specialty metals.